We’d love your help. Let us know what’s wrong with this preview of The Meaning of Names by Karen Gettert Shoemaker. Set in 1918 in the farm country at the heart of America, The Meaning of Names is the sto Stuart, Nebraska is a long way from the battlefields of Western Europe, but it is not immune to the horrors of the first Great War for Peace. Like all communities, it has lost sons and daughters to the fighting, with many more giving themselves over to the hatred only war can engender. To ask other readers questions about The Meaning of Names, please sign up. Gerta suffers a tragedy when she is young, one that will haunt her throughout her life. Leaving West Point, against the wishes of her father, she marries Fritz and they buy a farm, settling in Stuart, Nebraska. The year is 1918 and the farming life is a hard one. With four young children Greta is constantly busy, inside and outside the house. Yet their family is strong, but is it strong enough to withstand the draft when Fritz's name come up and when anti-German sentiment rears its ugly head in t Gerta suffers a tragedy when she is young, one that will haunt her throughout her life. Leaving West Point, against the wishes of her father, she marries Fritz and they buy a farm, settling in Stuart, Nebraska. The year is 1918 and the farming life is a hard one. With four young children Greta is constantly busy, inside and outside the house. Yet their family is strong, but is it strong enough to withstand the draft when Fritz's name come up and when anti-German sentiment rears its ugly head in their small town? Soon German families are leaving but Fritz and Greta stay, not wanting to give up something for which they have worked so hard. The characters in this novel are so very real, from the hardworking doctor to the young fervent priest taking over the parish church. This is a novel of a small town, all its characters, its prejudices, families helping families often at great risk to themselves. It is the best and worst of small towns and the prejudices of its people. Hard work and the joys and sorrows of families. Soon however, they will be confronted with something that will enact a higher toll than war and prejudice, one they will have few weapons against. Great book. You can tell that this was of a time and place that is very special to the author, and I'm guessing it is based on her own family. The characters drove the story during a time of twin turmoils in America's history, 1918. The first world war against Germany was turning the small town of Stuart, Nebraska, on its end with non-Germans becoming hostile against neighboring German Americans, even second generation Germans. The Spanish flu pandemic then turned the nation on its back, literally. Smaller presses are great. They put out tons of wonderful material every year. But the most captivating and well-worked stories often end up with the larger presses. It's as simple as survival of the fittest (or influence of the richest). There are always exceptions, of course. One notable exception in 2014 is Karen Gettert Shoemaker's The Meaning of Names. This little novel can go head to head with the big boys. It's eloquent, passionate, and entertaining. If you're wanting to get a head start Smaller presses are great. They put out tons of wonderful material every year. But the most captivating and well-worked stories often end up with the larger presses. It's as simple as survival of the fittest (or influence of the richest). There are always exceptions, of course. One notable exception in 2014 is Karen Gettert Shoemaker's The Meaning of Names. This little novel can go head to head with the big boys. It's eloquent, passionate, and entertaining. If you're wanting to get a head start on the year's best fiction, especially if you're in the market for historical fiction, check this one out. I was initially drawn to Karen Shoemaker’s book when I saw the cover on a friend’s Facebook page. An ominous storm gathering on the Nebraska plains, where the horizon is all sky. Beautiful and dark. And since it was published by Red Hen Press, who just published my friend’s eponymously titled book, The Gaffer, I decided to read it. I’m an old Nebraska gal myself. Set in 1918-1919 in rural Nebraska, we follow Gerda, who farms outside of Stuart, Nebraska with her husband and children. Gerda becomes I was initially drawn to Karen Shoemaker’s book when I saw the cover on a friend’s Facebook page. An ominous storm gathering on the Nebraska plains, where the horizon is all sky. Beautiful and dark. And since it was published by Red Hen Press, who just published my friend’s eponymously titled book, The Gaffer, I decided to read it. I’m an old Nebraska gal myself. Set in 1918-1919 in rural Nebraska, we follow Gerda, who farms outside of Stuart, Nebraska with her husband and children. Gerda becomes a fully-rendered character, a timeless woman, as she reconciles the choices she’s made: between her husband and her family of origin, between love and financial status, between religious dictates and her heart. At the same time, she wrestles with conditions outside of her control. The war overseas visits German immigrants in unexpected and hurtful ways at the same time virulent influenza sweeps the nation. Both things leave their marks on Gerda’s family, and all families during that place and time. We see how these forces impact other characters as well – my favorites were a small town doctor and a new priest. Like all good novels, the tension builds and we become more deeply invested in the characters over time. The writing is gorgeous, and the weather serves as almost another character. The ending is wonderful; a true study of fear, foreboding and faith. Well-researched facts are seamlessly woven into the story. It left me thinking a lot about my own ancestors who were in the same places, at the same times, and who must have shared these experiences, although their stories are now lost. Karen's book has restored something of them for me. A beautiful, poetic novel that belongs in the company of Cather and Stegner and other favorites. I hope many readers discover this one. It's a quietly brilliant gem. Beautifully written. Great characters. Alternate Title could be: Something Bad Is Going to Happen. This novel was written by my friend’s mother, Karen Gettert Shoemaker, and is a fictional account of her actual ancestors. Knowing a bit about how the novel was researched and written beforehand made reading it such an interesting experience! I love how detailed this period novel, set in Nebraska during the first World War, was. It made it so easy to sink in and understand what “normal” people in the Midwest experienced during WWI. Through a German American farming family and a doctor facing a cu This novel was written by my friend’s mother, Karen Gettert Shoemaker, and is a fictional account of her actual ancestors. Knowing a bit about how the novel was researched and written beforehand made reading it such an interesting experience! I love how detailed this period novel, set in Nebraska during the first World War, was. It made it so easy to sink in and understand what “normal” people in the Midwest experienced during WWI. Through a German American farming family and a doctor facing a culture skeptical of medicine, this book explores the specters hanging over the America at the time: the xenophobia of German immigrants and the impending flu plague that was the worst in recorded history. One of the most beautiful books I've ever read. I took my time with it for the first 100 pages, mostly because Shoemaker's language is so gorgeous and dense that each chapter felt like a feast; I needed time to digest before moving on. This was also a timely read--I put Nov. 4 as my start date, but I think I started reading it at the end of October. The anti-German, hyper-patriotic, xenophobic sentiment of 1917-1918 reminded me much of the toxic election season that coincided with my reading of One of the most beautiful books I've ever read. I took my time with it for the first 100 pages, mostly because Shoemaker's language is so gorgeous and dense that each chapter felt like a feast; I needed time to digest before moving on. This was also a timely read--I put Nov. 4 as my start date, but I think I started reading it at the end of October. The anti-German, hyper-patriotic, xenophobic sentiment of 1917-1918 reminded me much of the toxic election season that coincided with my reading of this book. On one hand, I was comforted because I know we came out on the other side of such awful treatment of others. On the other hand, I was devastated because we simply refuse to learn from history. Captivating. If I had to describe Karen Gettert Shoemaker's "The Meaning of Names" in one word that one word would be captivating. Full of rich prose and descriptive images I was sucked in from the first sentence. The chapters switch between Gerda, a young German housewife who was disowned by her family for marrying for love, and Dr. Ed Gannoway. At first I was a little confused but eventually the characters stories begin to intertwine and the chapter set up is proven highly effective. This book Captivating. If I had to describe Karen Gettert Shoemaker's "The Meaning of Names" in one word that one word would be captivating. Full of rich prose and descriptive images I was sucked in from the first sentence. The chapters switch between Gerda, a young German housewife who was disowned by her family for marrying for love, and Dr. Ed Gannoway. At first I was a little confused but eventually the characters stories begin to intertwine and the chapter set up is proven highly effective. This book is masterful. It's described as a book of the Great Plains and it is. I would venture to say a description like that would cause many to set the book back down because this book is "dry". There is no huge action scene. No all-encompassing romance. No incredible or fantastical heroic adventure. It details life. Every word that Shoemaker puts down on the page paints an incredible picture. Absolutely right book, right time, right place, etc. Stunning finish is only slightly weighed down by slowish moments in the early stages of the novel. The most moving dedication of any book I've read. I can't convey enough how much this book comes together in the end and gives a true, emotionally re Absolutely right book, right time, right place, etc. I can't convey enough how much this book comes together in the end and gives a true, emotionally resonant picture of how we're all trying to get by with the choices and struggles both in and out of our control. This is beautifully written. Shoemaker paints the physical and psychic landscapes so vividly. The characters are richly drawn and the novel is an important exploration of fear, prejudice, and misguided patriotism. I was determine to go back and finish a book I started for book Club in late 2015. It certainly highlights the struggles the families faced in middle America during the First World War. Very tragic. 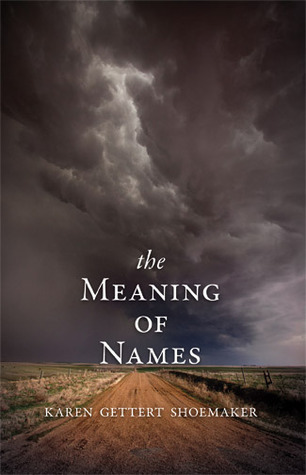 I don’t see a strong connection to the title “The Meaning of Names”. about as exciting as you would expect a novel of german farmers in nebraska in 1918 ever could be, but that said, it is thoroughly absorbing and interesting. flu, war, bugs, racism, dirt, lug-headedness, middle of nowhere. dirt too. lots of dirt. The Meaning of Names by Karen Gettert Shoemaker is a modern classic, quite a feat for a book set in 1917-18, but since it was written by a contemporary, I have to put it in that category. As far as it being a classic, I would put it alongside most of D. H. Lawrence's novels for pure quality of story, characterization, place, and time. The book tells its story from several points of view, switching back and forth as the story dictates. Following the entry of the United States into World War I, lif The Meaning of Names by Karen Gettert Shoemaker is a modern classic, quite a feat for a book set in 1917-18, but since it was written by a contemporary, I have to put it in that category. As far as it being a classic, I would put it alongside most of D. H. Lawrence's novels for pure quality of story, characterization, place, and time. The book tells its story from several points of view, switching back and forth as the story dictates. Following the entry of the United States into World War I, life in the small town of Stuart, Nebraska is disrupted by an outbreak of hatred for Germans, a difficult feat since most of Stuart is composed of German immigrants. Farm wife Gerda Vogel is tortured by memories of her sister's death in childbirth, Dr. Gannoway suffers with his crisis of faith, and everyone must deal with illness and death when the great flu plague of 1918 overcomes the struggling community. As the novel weaves its way toward its (not inevitable) conclusion, Shoemaker engages the reader at a very high level, moving in and out of interconnected lives as if the novel were a first rate symphony. The writing is beautiful and engaging and the book never lets one down. "When Gerda was five, her older sister came home to die. No, not to die, to give birth, but dying is what she did." Set at the start of WWI, the story focuses on Gerda Vogel, a German immigrant in Nebraska at the start of World War I, her husband Fritz, and their family as they eke a living out of the land, grapple with anti-German sentiment stirred up by the war, and fight to survive the influenza pandemic. The details of daily life come to life and feel as real as a handful of fertile black soil, as do the taut emotional moments and life-and-death situations that the characters find themselves in especially as the flu takes hold in their community. The third-person viewpoint deftly conveys the inner lives of several of the characters, including Gerda, Fritz, Dr. Gannoway, who risks his own life to treat the flu victim, and a young, clubfooted man John Kaup, whose desperation to serve also puts him in danger. Originally, I was drawn to this book because of parallels with my own family history. My grandfather, the grandson of German immigrants, was born in Iowa in 1914, and also spent part of his childhood in Nebraska. The book is written almost like two separate stories, with chapters alternating between getting to know Gerda and Dr. Gannoway. In getting to know Gerda and reading about her life as a midwest farm wife at the turn of the century, I felt like I could have been standing in my great-grand Originally, I was drawn to this book because of parallels with my own family history. My grandfather, the grandson of German immigrants, was born in Iowa in 1914, and also spent part of his childhood in Nebraska. The book is written almost like two separate stories, with chapters alternating between getting to know Gerda and Dr. Gannoway. In getting to know Gerda and reading about her life as a midwest farm wife at the turn of the century, I felt like I could have been standing in my great-grandmother's kitchen. The day-to day thoughts of the mother of young children were believable, if not exciting. Dr. Gannoway's character provided a different point of view of the epidemic, and later chapters include more perspectives from other characters. Shoemaker writes beautifully, describing scenes and emotions in ways I don't want to forget. More than once, I just had to write down paragraphs I wanted to remember, either because of the way they touched me emotionally or because of the fabulous descriptive prose. Although I was able to get absorbed in the book's setting, and felt like I knew the characters, I felt that it lacked plot, and the author should have done more to tie together some of the events. Historic fiction, WW I, American German, 1918 Flu Pandemic. The book was set in Nebraska. I liked the book and would recommend it to others. The Meaning of Names is the story of Gerda Drueke Vogel, a Nebraska Sandhills daughter, sister, wife and mother. To each of her family roles, Gerda gives her strength, determination and love. The world around Gerda is in deep chaos. The year 1918 finds her community in conflict with itself as war rages in Europe and the prospect of conscription to service abroad hangs over the head of her husband. Into this storm marches the great influenza pandemic. The story carries Gerda through a year of ex The Meaning of Names is the story of Gerda Drueke Vogel, a Nebraska Sandhills daughter, sister, wife and mother. To each of her family roles, Gerda gives her strength, determination and love. The world around Gerda is in deep chaos. The year 1918 finds her community in conflict with itself as war rages in Europe and the prospect of conscription to service abroad hangs over the head of her husband. Into this storm marches the great influenza pandemic. The story carries Gerda through a year of extraordinarily hard times, into which memories of past sorrows bubble up. But, Gerda finds quiet joy in her family and strength in her roots. This book is as dense and rich as German chocolate. There is no wandering in this novel, no wasted words. The reader is drawn from the first sentence into this sometimes dark, deeply heroic novel. This is a beautiful book, plain and simple. And, to me, it doesn't get much better than that. Like so many of my favorite books, Shoemaker takes a story that could be so full of an often-trod history and gives it a unique voice, quieter, and a genuinely heartfelt tale. The story of the Vogels is genuinely touching and provides a wonderful illustration of how our worlds--no matter how private--are affected by the goings on in the world and the general mindset of others. Even more, buried within the This is a beautiful book, plain and simple. And, to me, it doesn't get much better than that. Even more, buried within the larger context is a quiet love story of those that aren't building their love, but are surviving it--awesomely. This was an enjoyable book. Much of the writing was beautiful with many poetic passages. It was a great book for book club discussion. Themes/subject matter included WWI, the Spanish flu epidemic, anti-immigrant sentiment, propaganda, and family relationships. It was also fun to read a book set in rural Nebraska and be reminded about how hard early settlers and farmers worked. It had 2 main storylines: that of Gerda, a German-American farm wife, and that of Dr Gannoway, a rural doctor. I enjoyed This was an enjoyable book. Much of the writing was beautiful with many poetic passages. It was a great book for book club discussion. Themes/subject matter included WWI, the Spanish flu epidemic, anti-immigrant sentiment, propaganda, and family relationships. It was also fun to read a book set in rural Nebraska and be reminded about how hard early settlers and farmers worked. It had 2 main storylines: that of Gerda, a German-American farm wife, and that of Dr Gannoway, a rural doctor. I enjoyed Gerda's storyline more, and am not sure if the physician's sections were necessary or not. Nebraska author. A solid B+ book. Some pieces were excellent and a few lines were profound, but overall her character development wasn't great-I didn't care about any of them and a lot of the time I had to force myself to read it since it was a book club book. Learned about the great influenza plague of 1918 and about the prejudice against Germans in Nebraska during WWI years. That was beneficial to learn about. This book has a lot going for it. The good points - it has some really wonderful layered characters, I especially liked and related to the wife and mother Gerda. The setting in Nebraska during World War I is beautifully done. I love it when a setting and a time period help me understand what it was like at that time and place.